Leading hot tub brands will be promoting their products under the Atlantic City Pool & Spa Show’s new name of The Pool & Spa Show for the 2015 event celebrating its 34th anniversary this week. The Pool & Spa Show exhibition, organised by the Northeast Spa and Pool Association, is running from January 27 to 29 in the Atlantic City (New Jersey) Convention Centre where it will be hosting a number of WhatSpa? and WhatSwimSpa? Best Buy Award winners. Among more than 400 exhibitors, filling over 100,000 sq.ft of exhibition space, will be Artesian Spas. The hot tub brand, from May Manufacturing, has been extending its presence in Europe during recent trade shows at Piscine Global in Lyon and the UK Pool & Spa Expo in Birmingham hosted by the NEC last week. This year the producers of the WhatSpa? Best Buy Award-winning South Seas 518P, Antigua 33 and Dove Canyon, are among a large percentage of home-based manufacturers at the USA exhibition and will be promoting additions to the TidalFit range that includes the WhatSwimSpa? Best Buy Award-winning TidalFit EP-14. Dealerships now have the option of a powerful TidalFit Active EP-12 Above Ground model, which comes in at 366 x 231 x 114cm and has a water capacity of 4,921L. It has a dry weight of 794kg and a filled weight of 5,711KG. The Active Plus EP-12, meanwhile, has the option benefit of being available as an Above Ground or Semi In-Ground model. Coming in at the larger size of 487 x 231 x 152cm, a new TidalFit Power Plus EP-16 has also been launched for 2015 as the first hydraulic propeller TidalFit model with a Variable Current Swim System that provides nine times more flow rate than traditional swim spas. It has a water capacity of 8,328L, a dry weight of 1,588KG and filled weight of 9,910KG. 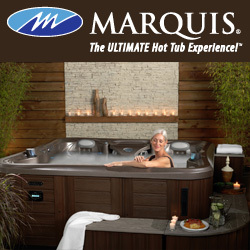 Marquis Spas, who landed a WhatSpa? Best Buy Award in the £6,000 to £7,900 category for its best-selling four-seater Spirit model featuring the unique Tri-zone therapy controls and patented HydroKinetic jets, is another USA manufacturer turning its attention to its ‘home’ territory before an appearance at SPATEX, from February 1 to 3 at the Ricoh Arena in Coventry to promote its ‘Dealer Direct’ strategy to UK visitors. After officially launching its Aquatic Training Vessel (ATV) to the British market at the UKPSE ahead of attending SPATEX as an exhibitor on Sunday, Marquis will be promoting its full range of products at the USA exhibition. During the dedicated UKPSE Consumer Day on Saturday, Marquis Spas Director of Global Sales Steve Hasenmueller put the ATV, which comes in at 168.5” x 89.5” x 56”, through its paces with a full spectrum of water-filled training routines, including swimming, walking and rowing, for trade visitors and members of the public. The ATV, produced with ultra-strong bonded polymer resins that are used in the construction of the marine industry’s most expensive and rugged boat and yacht hulls, will also be promoted at SPATEX along with Microsilk capabilities in the a selection of Marquis hot tub models. Viking Spas, which was represented at the UKPSE at the NEC by European distributor Anthony Schneikert of Spa Solutions, has increased its European sales in the past year and will now be aiming to ramp up its home territory and global dealer network promotion during the USA exhibition. The manufacturer has gained a WhatSpa? Best Buy Award for the Supreme model that comes in at 198 x 198 x 86cm and has been designed with the new unique SOFT-TOUCH shell material. With a lounger and Vikasage seating to accommodate six people, the flagship model has been manufactured with a Fortiflex High Density Polyethylene (HDPE) Shell and the SOFT-TOUCH process that Viking Spas has introduced to its production, which is non-slip polyethylene material that provides the look and feel of acrylic with the lightweight and durable benefits of roto-moulded spas. Saratoga Spas, which has a fledgling distribution deal with BISHTA and SPATA award-winning company Deep End Pools, will be promoting its enviable East coast manufacturing reputation during the USA exhibition after receiving its first ever WhatSpa? Best Buy Award recognition for the diminutive three-seater Saratoga Spas Exmoor, coming in at 120 x 180 x 73cm, in the under £3,999 price category. As well as proclaiming that its products are ‘Sourced in America and Made in New York’, Deep End Pools has been helping the manufacturer to establish UK showroom sites and a dealer network to promote the pedigree credentials of the Saratoga Spas brand from Imperial Pools; which is also exhibiting at the US event and boasts some of the industry’s unique patents with the ‘Saratoga Safeguard System’ promise for peace of mind hot tub retailing and customer satisfaction. Among the Canadian contingent at the US exhibition will be manufacturer Hydropool, which has gained a WhatSpa? Best Buy for the H670 Platinum. It has also been making waves with its swim spa range and landed a WhatSwimSpa? Best Buy Award for its AquaTrainer 19DTfx that is in a flourishing stable of products endorsed by former Olympic swimmer Sharron Davies. Exhibitors targeting hot tub retailers at the event, with booth details, include: AquaFinesee 2736, Arctic Spas 4043 & 3850, Artesian Spas 2845, Bullfrog Spas 2645, Burton Spas 3850, Catalina Spas 1929, Clearwater Spas 2243, Hydropool Hot Tubs/La-Z-Boy Spas 2145, Imperial Pools 2737, Marquis Spas 1907, Northeast Spa & Pool Association 4141, Passion Spas 3943, Pleatco 1731, Premium Spas by Premium Leisure 1437, QCA Spas Inc/Thera Sauna 1419, Saratoga Spa & Bath Company 2937, Spazazz 2222, Strong Spas 3419, Sunrise Spas/Dream Maker Spas 3205, Swim ‘n Play 2042, Viking Spas 2655. Opening times for The Pool & Spa Show will be from 11am to 5pm on Tuesday and Wednesday, January 27 and 28. On the final day, January 29, the Exhibition Hall will be open to visitors from 10am to 2pm. The Education Conference, running today until 5pm at the host venue, will continue on Tuesday and Wednesday from 8:30am to 11:45am, while the final day’s Education Conference, on January 29, is set to run from 10am to 2pm.